Harley Quinn is a fictional Character, a super villain in the DC Universe. The character was introduced on September 11, 1992, in Batman: The Animated Series and later adapted into DC Comics' Batman comic books, first appearing in The Batman Adventures (September 1993). As suggested by her name (a play on the word "harlequin"), she is clad in the manner of a traditional harlequin jester. 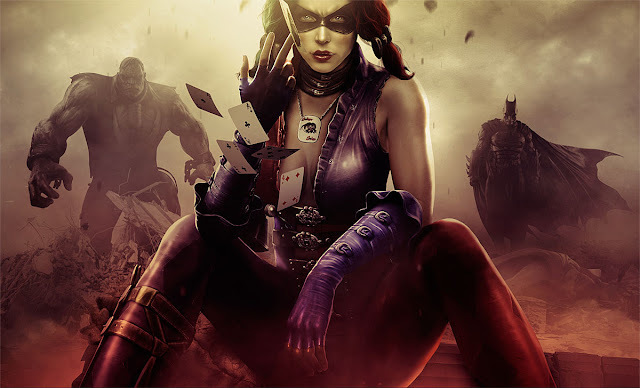 The character is a frequent accomplice/girlfriend of Batman's nemesis the Joker, and is also close to Poison Ivy, from whom she gained her immunity to poisons and toxins. More about Harley Quinn (DC Comics) Character Review - keep on reading !! The character was created by Paul Dini and Bruce Timm and was originally voiced by Arleen Sorkin in Batman: The Animated Series and its tie-ins. The character was voiced by Hynden Walch in The Batman animated series. In the Birds of Prey series, she was portrayed by actress Mia Sara and, in an unaired version of the pilot episode, by Sherilyn Fenn. Throughout her animated depictions, she is shown to speak with a pronounced Brooklyn accent. IGN's 2009 list of the Top 100 Comic Book Villains of All Time ranked Harley Quinn as #45. She was ranked 16th in Comics Buyer's Guide's "100 Sexiest Women in Comics" list. Harley Quinn first appeared in the Batman: The Animated Series episode "Joker's Favor", as what was originally supposed to be the animated equivalent of a walk-on role; a number of police officers were to be taken hostage by someone jumping out of a cake, and it was decided that to have the Joker do so himself would be too bizarre (although he ended up doing so anyway). Dini thus created a female sidekick for the Joker. Arleen Sorkin, a former star of the soap opera Days of Our Lives, appeared in a dream sequence on that series in which she wore a jester costume; Dini used this scene as an inspiration for Quinn. Having been friends with Sorkin since college, he incorporated aspects of her personality into the character. The 1994 graphic novel Mad Love recounts the character's origin. Told in the style and continuity of Batman: The Animated Series and written and drawn by Dini and Timm, the comic book describes Dr. Harleen Quinzel, M.D. (her real name) as an Arkham Asylum psychiatrist who falls for the Joker and becomes his accomplice and on-off sidekick. 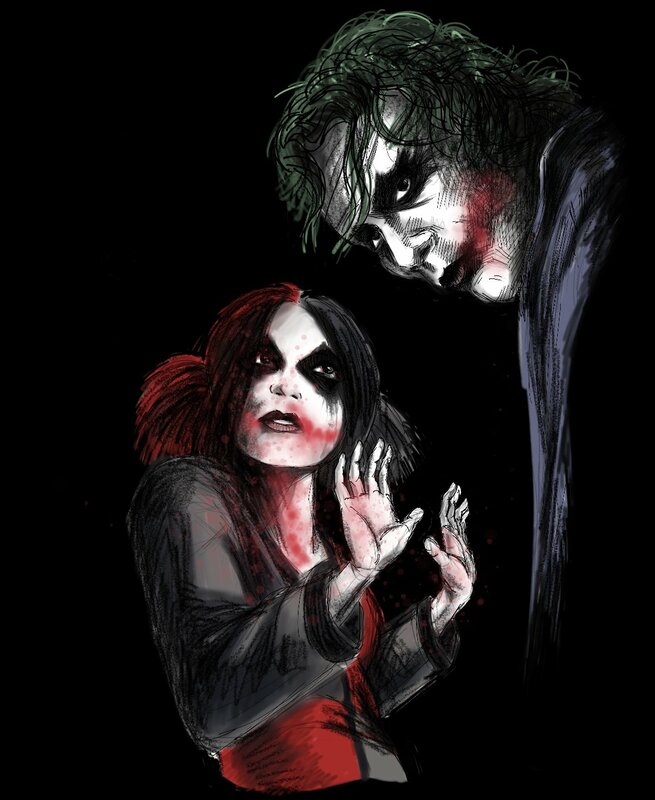 She becomes fascinated with the Joker while interning at Arkham, and volunteers to analyze him. She falls hopelessly in love nearly instantly with the Joker during their sessions, and she helps him escape from the asylum more than once. 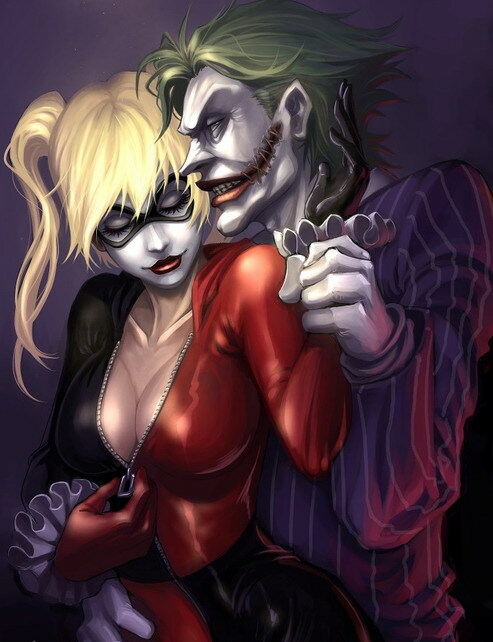 When the Joker is returned to Arkham after a battle with Batman, the sight of her badly injured patient drives Harleen insane, leading her to quit her psychiatrist job and don a jester costume to become Harley Quinn, the Joker's sidekick. She later becomes fast friends with Poison Ivy, who injects her with an antitoxin which gives her super-normal strength, agility, and immunity to toxins. Prior to the release of Batman & Robin (Film), Mark Protosevich was commissioned by Warner Bros. to write a script for a fifth Batman film titled Batman Triumphant to be directed by Joel Schumacher, with Harley Quinn and Scarecrow as the film's villains. Protosevich wrote Harley as the Joker's daughter seeking revenge, not his lover and henchgirl. Due to Batman & Robin's poor box office run, bad Internet buzz, and several negative reviews from critics, Triumphant was never made, and the film franchise went on hiatus for eight years until Batman Begins in 2005. In Batman Beyond: Return of the Joker, Harley appears in Barbara Gordon's flashback alongside the Joker after he kidnapped Tim Drake for an experiment to convert him into a surrogate son because they did not want to take any chances with pregnancy's common risks. She acts as the mother in Joker's family in a cruel parody of motherhood, affectionately referring to Drake as "Sweetie" during her appearance. 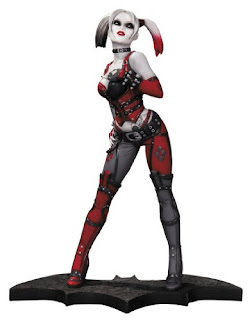 She fights Batgirl while Batman chases the Joker and sends Drake to bring Harley her bazooka. As she is about to drop a rock on Batgirl she sees Drake waiting with the bazooka and catches it before Batgirl can intercept it. After firing off a few shots Batgirl knocks the bazooka out of Harley's hand, causing it to fire at the pair when it hits the ground. The two fall off a cliff but Batgirl manages to grab a ledge and Harley, trying to save Quinn from falling. Unfortunately, Harley's sleeve rips and sends her plummeting down into the cliff, afterwards her body is never found and she is presumed dead. Despite having been apparently killed in the flashback sequence, Quinn makes a cameo appearance as "Nana Harley" at the very end of the movie when she bails her two granddaughters Dee Dee out of jail approximately 40 years later. 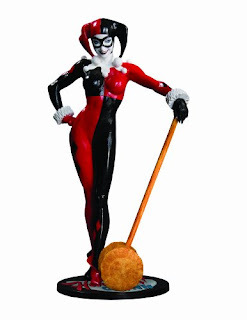 Harley was again voiced by Arleen Sorkin. In Justice League: Crisis on Two Earths, Harley is the name of a monkey owned by the Jester (Joker's Parallel Earth equivalent).